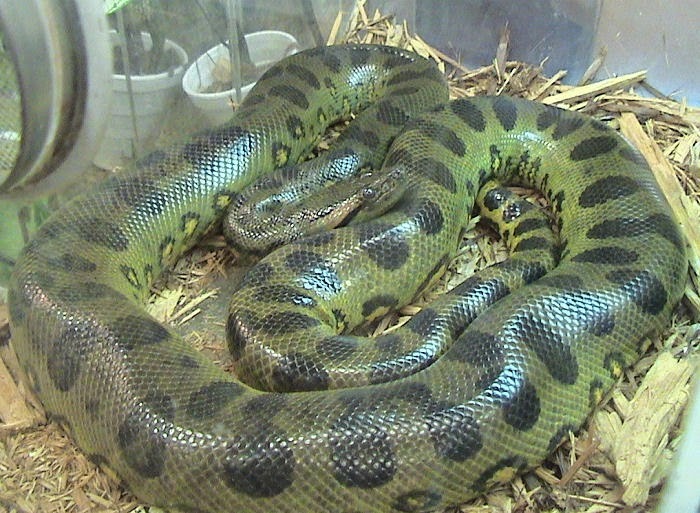 Reportedly, the green anaconda is 16-foot-long. What could go wrong? A reptile expert said Friday that he wants to go "on the record" and confirm that New Jersey authorities are searching for an anaconda, not a boa constrictor, in the state's largest lake. "I was sworn to keep my mouth shut by local officials to avoid causing a panic," Gerald Andrejcak, the specialist, told NJ.com. "Now that there's a panic, I'm going on the record." He said when the snake was called a boa, it wasn't exactly a lie, because the snakes are technically in the same family. However, anacondas, made famous by the 1997 movie starring Jennifer Lopez, can send chills through a community because their diet consists of deer and other large mammals. They also have no natural predators. Andrejack, who works for Common Sense for Animals, was searching Lake Hopatcong in Jefferson Township, which is in the northern part of the state. He told the paper that he determined it was a green anaconda last week after hearing reports about the snake's behavior and where it was spotted. He said he told a member of the Hopatcong animal control about his suspicions and was told to keep quiet.